Lexington, Ky. – On a night dedicated to the horse, two special athletes were recognized for their excellence in 2016 during the USEF’s Horse of the Year Awards Gala. Mighty Nice and Catch Me reached the pinnacle of their sports and were named International and National Horse of the Year, respectively. Voting was open to the public through January and both horses, already fan favorites, were rewarded for their tremendous results throughout 2016 with support from voters. Mighty Nice, known as “Happy,” was previously owned by the late Bruce Duchossois. After he passed away, a group of Duchossois’ friends came together to support Happy and formed the HnD Group, named after his HnD Farm. In 2016, Phillip Dutton and Mighty Nice earned fourth-place finishes in the Rolex Kentucky Three-Day Event presented by Land Rover CCI4* and The Fork CIC3*. The pair’s highlight of the year was earning the eventing Individual Bronze medal at the Rio 2016 Olympic Games. Catch Me, or “Snoopy,” owned by David and Becky Gochman, was purchased from Lisa Cudahey, where he was trained by Cookie Beck and Crystal Knight, in 2015. That summer, he was diagnosed with a rare neurological disease called botulism, which almost ended his life. After making a full recovery, Snoopy went on to end the 2015 show season with multiple champion and reserve champion wins at the major indoor championships. In 2016, he continued his winning ways with Scott Stewart aboard in the Second Year Green Working Hunter division. 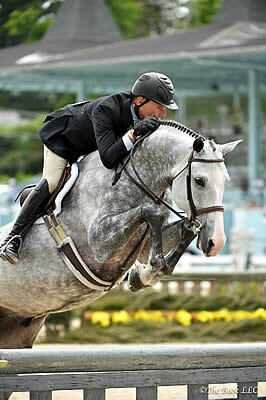 He also won the WCHR Peter Wetherill Palm Beach Hunter Spectacular, which was a first for Stewart as well. Snoopy concluded his show season in a dominating fashion when he was Champion at the Capital Challenge Horse Show, Pennsylvania National Horse Show, Washington International Horse Show, and CP National Horse Show.